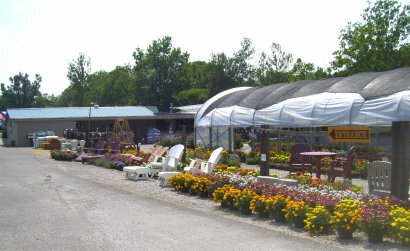 Our Garden Center and Nursery is located at 6280 S. Old State Road 37, in Bloomington, Indiana. We have been in business for 50 years and quality plants are still our specialty. We have everything to make your garden beautiful! We grow a large selection of flowers and plants such as Perennials, Annuals, Houseplants, Cactus, Tropicals, Orchids, Bonsai, Vegetables, Herbs, Fruits, Water Plants, Trees and Shrubs. We offer a wide and unique selection of pots, planters, lawn and garden accents, and many other great items. We also carry landscape supplies such as mulch, landscape stone, and soil ammendments.